As the 2010 IZOD IndyCar Series capped their road racing with Will Power claiming the tour's inaugural Mario Andretti Trophy after scoring the most points this season. With the circle track's AJ Foyt Trophy honours as well as an overall championship still in play, a large contingent of open wheel runners race into the dawn on the Chicagoland Speedway in Joliet, Illinois. Returning to ovals after more than two months, the IZOD IndyCar Series drivers and teams lead a final thrust to the season finale in Homestead-Miami Speedway. With Penske Racing's Ryan Briscoe finding the edge over Target/Chip Ganassi Racing's Dario Franchitti in qualifying for the Peak Antifreeze and Motor Oil 300, the #6 of Briscoe retained 1st place. A short-lived green flag period lasted only until lap 5 when the yellow flag was thrown after a turn 2 collision between #2 of Raphael Matos and the #36 driven by Tomas Scheckter. Both the de Ferran/Dragon Racing #2 and the #36 Conquest Racing cars ended their runs way too early at Chicagoland Speedway. To the delight of the IZOD IndyCar Series fans on attendance at Chicagoland. lead changes on the 1.52 miles oval came fast and furiously. Through the Peak Antifreeze and Motor Oil Indy 300, no fewer than 25 lead changes among 11 competitors. With 29 cars entered in this Saturday night race, this meant more than 1/3 of the field had an opportunity to lead at least one lap. However, even as a wide assortment of IZOD IndyCar Series drivers paraded the field from the front, pole sitter Ryan Briscoe was able to center his #6 Penske Racing Dallara-Honda in the top spot for the lions share of the 200 laps leading 113 circuits.It should be noted that the #26 Andretti Autosport car of Marco Andretti was able to get the better of Briscoe three times in the first half of the event to lead laps. At lap 78, Brazilian Ana Beatriz brought out caution after brushing the turn 4 wall as a prelude to a scenario where four cars, including the #24 of Beatriz would be retired through the next 10 laps. As many IZOD IndyCar teams ducked into pit road, the KV Racing Technology teammates added another embarrassing incident to their team this season. The #5 of Takuma Sato and the #8 of EJ Viso made contact with each other on pit lane leading to the retirement of both vehicles. Viso had been running 6th prior to the car being too damaged to continue. With pit stops completed, the field prepared to be sent back to green only for the restart to be called off by a collision involving the #06 of Hideki Mutoh, the #14 car of Vitor Meira and the #77 driven by Alex Tagliani. Of the three cars, only Tagliani's day was ended. "It's really unfortunate for the whole team; the Bowers and Wilkins/TorcUP car was great. I think we had the car to beat tonight" Tagliani said following his race retirement. Ryan Briscoe proceeded in the lead of the Peak Antifreeze and Motor Oil 300 well past the halfway point of the event making it look certain the Australian driver could could on track for a 2nd IZOD IndyCar win in 2010. The advantage Briscoe utilized through the early stages of the Chicagoland race seems the #6 car from the Penske stable did not have the stamina to over what would be a unfortunate pit stop. So strong at the front, Ryan Briscoe's car just wasn't configured for mastering traffic. Commenting in post-race, Briscoe said "After that last stop, we lost a little track position. I tried everything that I could, but my car was just not as good in traffic". Beyond lap 136, Ryan Briscoe's time at the front was over for the night finishing 11th in the final results. With Ryan Briscoe out of contention for the rest of the Peak Antifreeze and Motor Oil 300 at Chicagoland Speedway, the lead of the race was up for grabs with Dan Wheldon, Vitor Meira and even Will Power taking turns in the first place spot. A lap 169 caution for a spinning Alex Lloyd would setup a pit stop which would determine the winner of this IZOD IndyCar race. Winning a fight out of pit road, Target/Chip Ganassi Racing pit crew for Dario Franchitti's #10 car sent the Scot out first. Through the final 24 laps, Franchitti would resist the attacks of Dan Wheldon and Marco Andretti to win the Chicagoland Speedway's Peak Antifreeze and Motor Oil 300 by a mere 0.0432 seconds as the #4 attempted to steal the trophy out the final turn. Becoming Dario Franchitti's first win since the 2010 Indianapolis 500, the Chicagoland Speedway race appears to be the pivotal time for the Target/Chip Ganassi Racing driver to mount his charge. As Will Power stumbled to 16th on the oval following a fuel-only stop under green, Franchitti gained 34 points on the #12 Penske Racing driver to bring the two competitors just 23 points apart with three races to go in the 2010 IZOD IndyCar Series season. Interesting enough, the top-3 for the Peak Antifreeze and Motor Oil 300 mirrored the podium of the 2010 Indy 500. After spending part of the next round of the IZOD IndyCar Series upside down, Wheldon's 2nd place finish matches his best performance the major Memorial day race. In post race, Dan Wheldon commented "To be honest at the end, the reason I worked so hard with Dario (Franchitti) and just tried to stay with him was because he was so clean and professional. He is a true gentleman out there and a great driver. I have to take away with the guys on our team. They did an excellent job and it was a strong performance." Marco Andretti also enjoyed a competitive outing leading a strong result for 3 of the 4 Andretti Autosport drivers as Ryan Hunter-Reay and Tony Kanaan followed to round out the top-5. 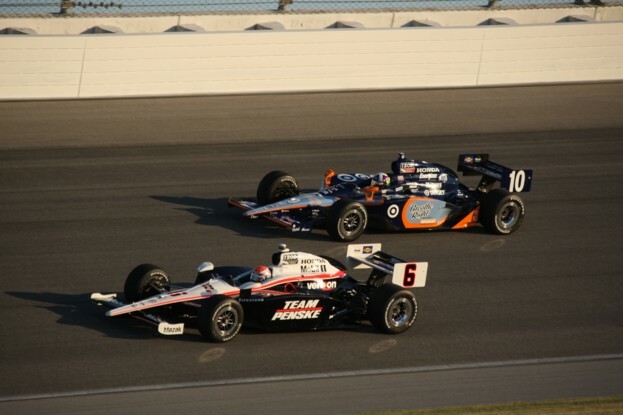 Next up for the IZOD IndyCar Series will be another night race on September 4th at the Kentucky Speedway.